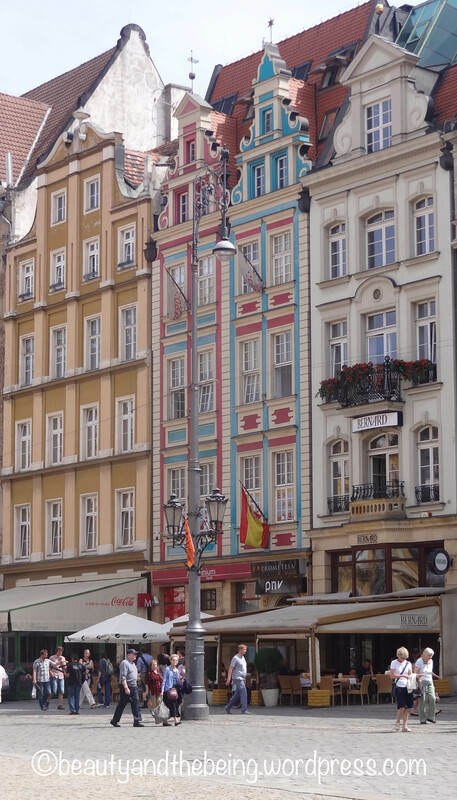 Welcome back to Day trips from Krakow Part II- Today’s post features one of the most picturesque cities of Poland which was once a part of Germany, Czech Republic and even Austria. 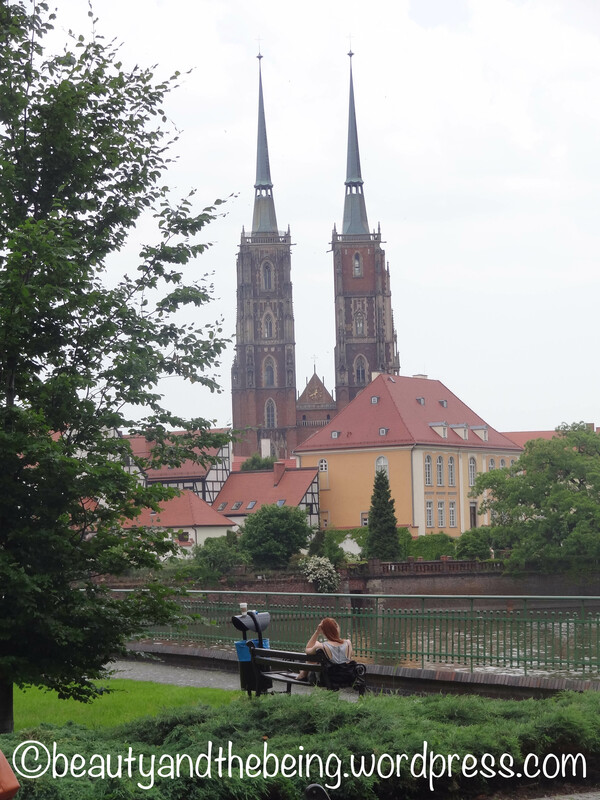 Let’s go right ahead and take a look at one of my favourites cities in the whole world, Wroclaw. 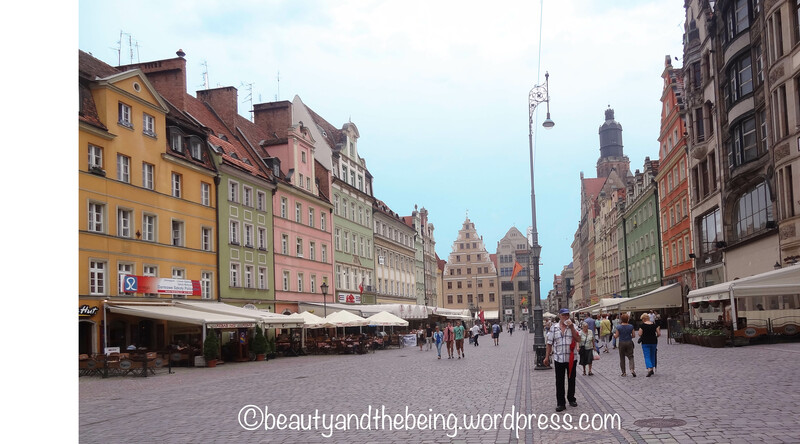 I visited Poland last year for a business trip and did my research beforehand on what all places I could visit in my free time and at a very initial stage of research I was pretty convinced that Wroclaw was a place I didn’t want to miss out on. 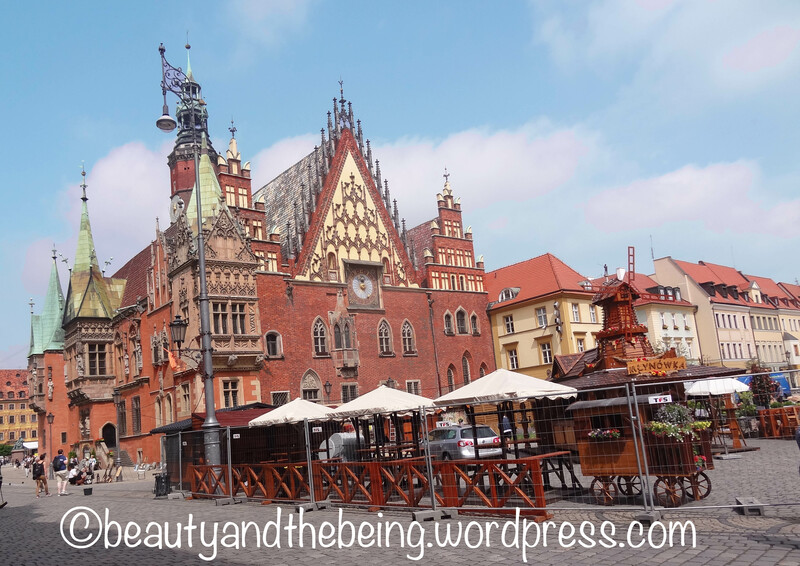 Wroclaw is just 3 hours away from Krakow, so I had booked just a day in advance through PolskiBus.com and it costed 29 zł one way (It is even more cheap if you book in advance). 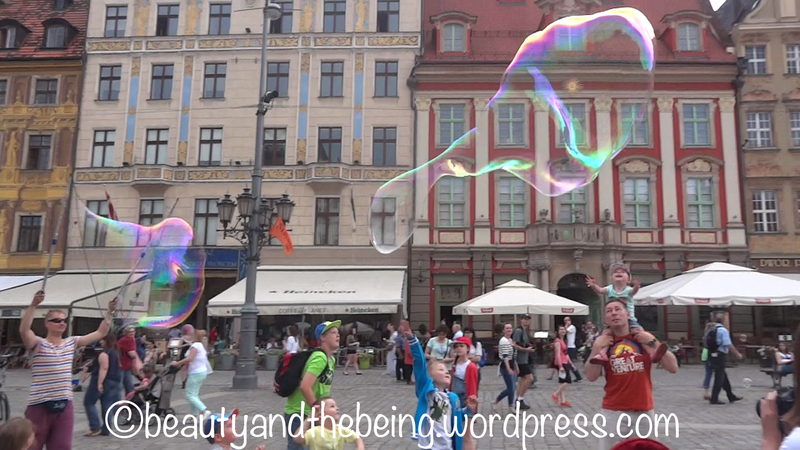 One could easily make a day trip if you have your base in Krakow like I did and enjoy the city’s various wonders. 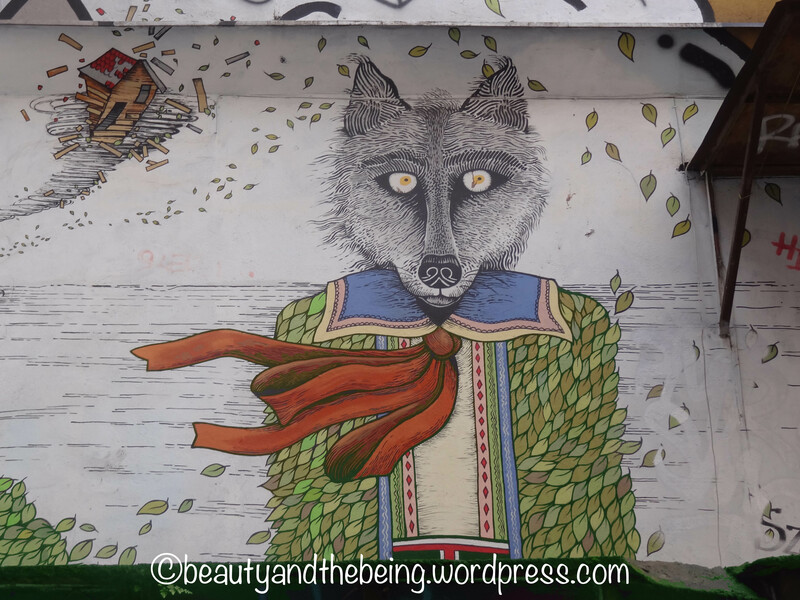 Though I strongly feel that one day is just not enough to explore this lovely city. 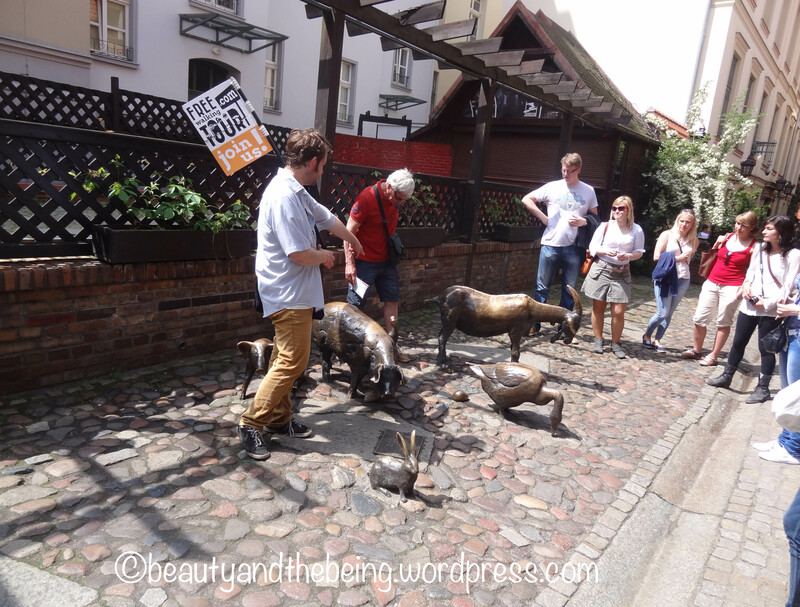 Since I was in Wroclaw only for a day I wanted to make the most of it and thus opted for a Free Walking Tour which was awesome. I strongly recommend it even if you are there for more than a day since it gives a great overview of the city and the interesting history to it. The guides are brilliant and pretty knowledgable and give you a great sneak peak into the history and culture of the beautiful city. Most of the guides are university students and conduct these tours out of sheer passion and one should not shy away from tipping them generously. 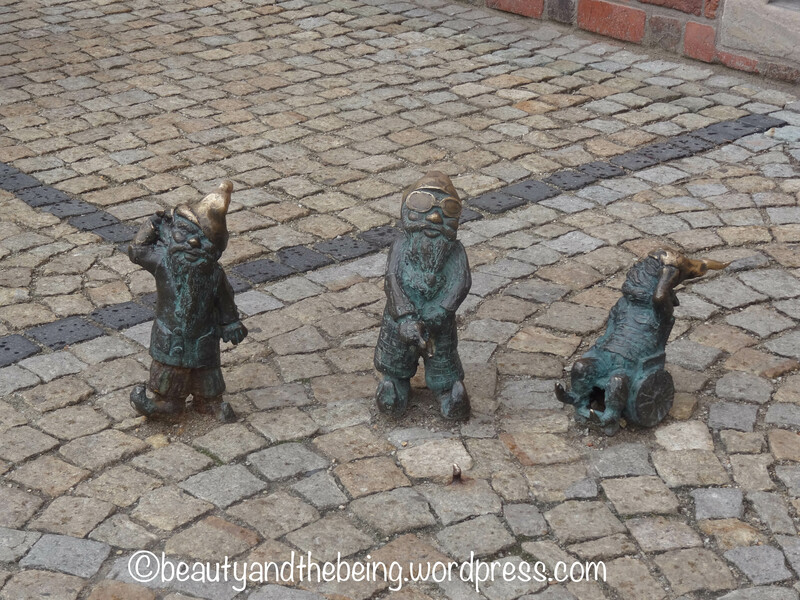 Wroclaw has some of the most quirky sculptures all over the city and equally quirky anecdotes/ tales/legends behind these sculptures. The one below is a memorial to slaughtered animals. Built bang opposite a row of art galleries this sculpture is a reminder of the street’s history. Simon from the freewalkingtours.com telling us the interesting story behind the sculpture. 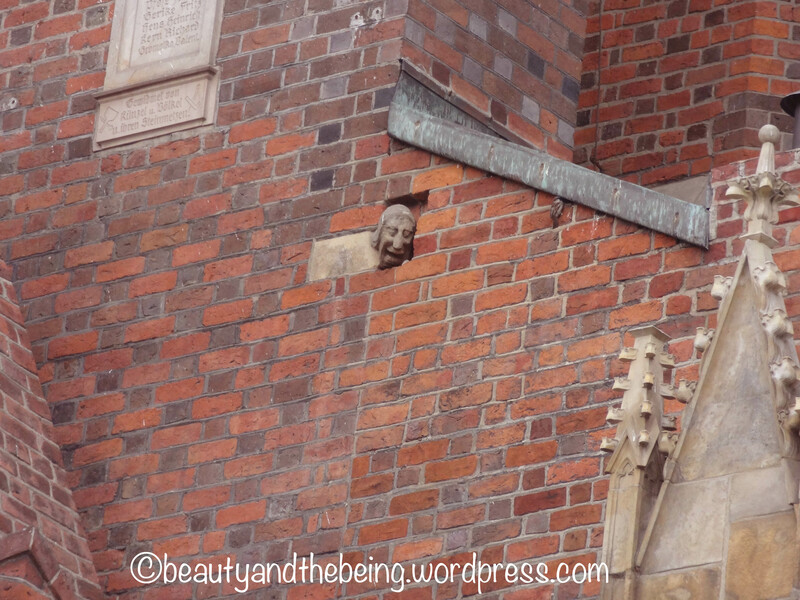 Talking about legends and quirky sculptures the one which blew me off completely was a story about the head of a young boy jutting out from on of the walls of the Cathedral of John the Baptist. The legend has it that this head belonged to a poor boy, who fell in love with the daughter of a rich man who didn’t approve of this alliance and it made the young boy really angry and in his rage he burnt the rich man’s house and then climbed a tower to look at the spectacle. However punishment reached him as the walls of the tower tightened around his neck and absorbed him and what was left was just his head with an expression of grimace of horror. 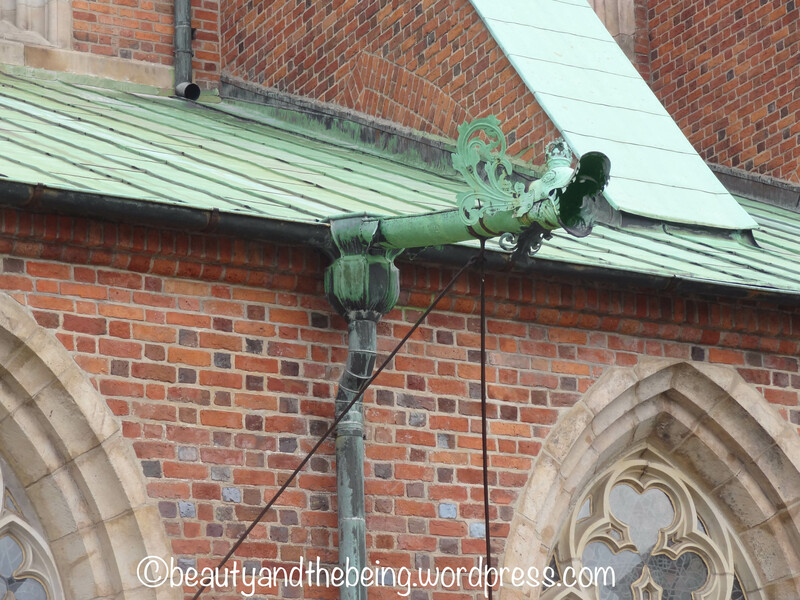 Another one is about the dragon head shaped spouts called Gargoyle which direct rain water on to the floor. Some say it is there to scare off the evil spirits and then there are some who believe that Gargouille dragon was a good dragon which use to spout water and not fire but a priest casted a spell on it and turned it into stone. Soon people realised their mistake and carved it into the corners of every stone building as water ducts in honor of the beast. Unlike Krakow, communication might get a bit difficult here as not everyone speaks in English and the tram system is also a bit different. You can only buy tickets through your credit or debit card. I was lucky though to find a local who spoke English and even helped me with the tram tickets and directions. 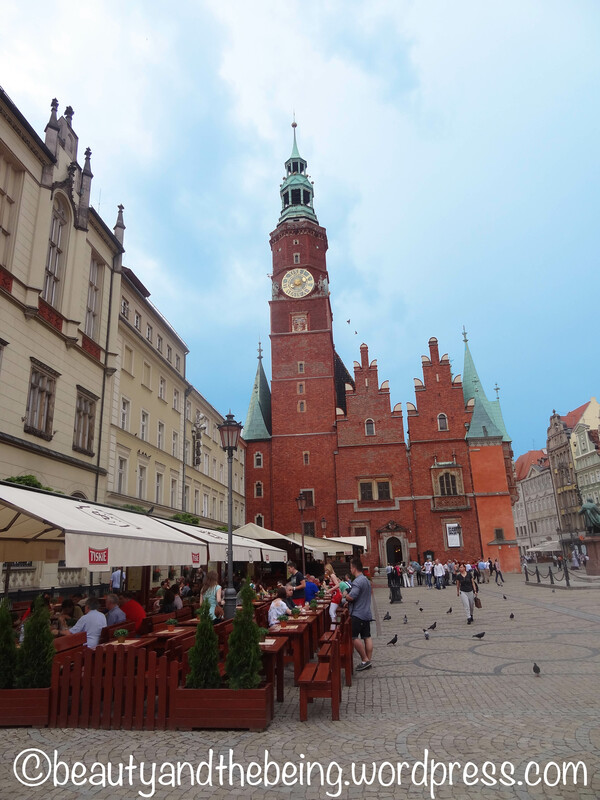 I found people all across Poland to be really friendly and charming, they are very approachable and always greet you with a smile. 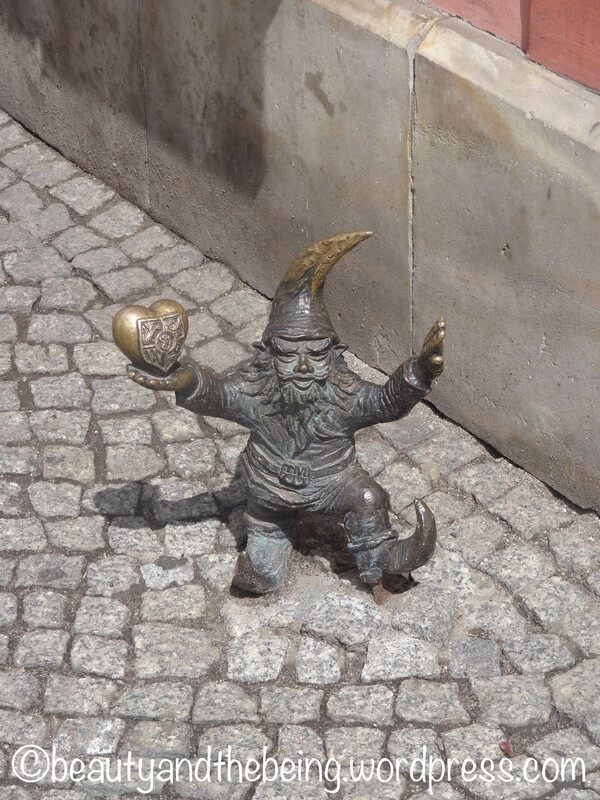 Apart from the lovely buildings all across the old square what I loved the most were the mythical little sculptures of Gnomes, present all across the old city. Created in the form of a testimonial to the Orange Alternative Movement, these represent the underground protest groups that had peacefully opposed communist regime in the ’80s. 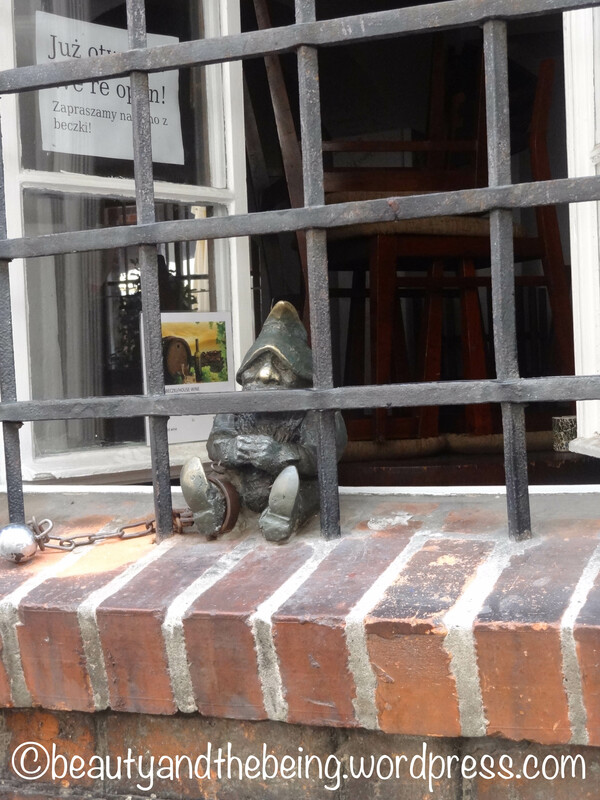 You can get a special map or even download it from the internet and try to chase as many Gnomes as you can, Currently there are more than 300 spread all across the old town. 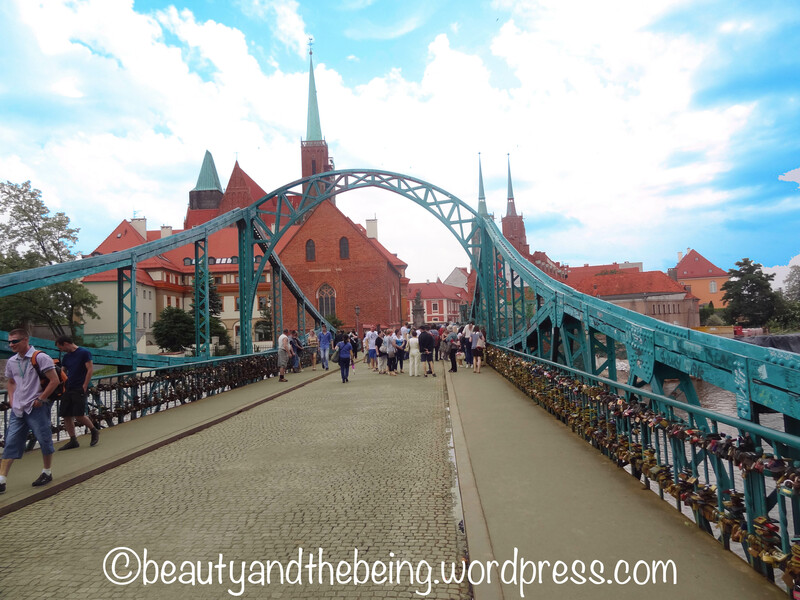 Wroclaw is often called as the city of hundred bridges, the best one being the Tumski Bridge. 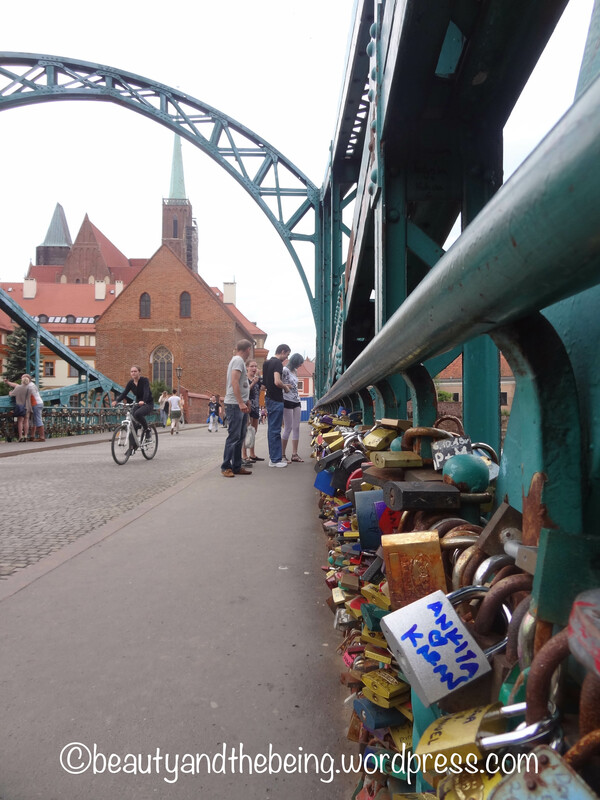 Though there are several love lock bridges all across Europe, this one is by far my favourite. Another great sculpture which I found was of this ballerina wearing a skirt in shape of a globe. It was built as a visual metaphor for the World Music Days Festival which had taken place in the city a few years ago. The Ballerina wearing Globe shaped skirt. 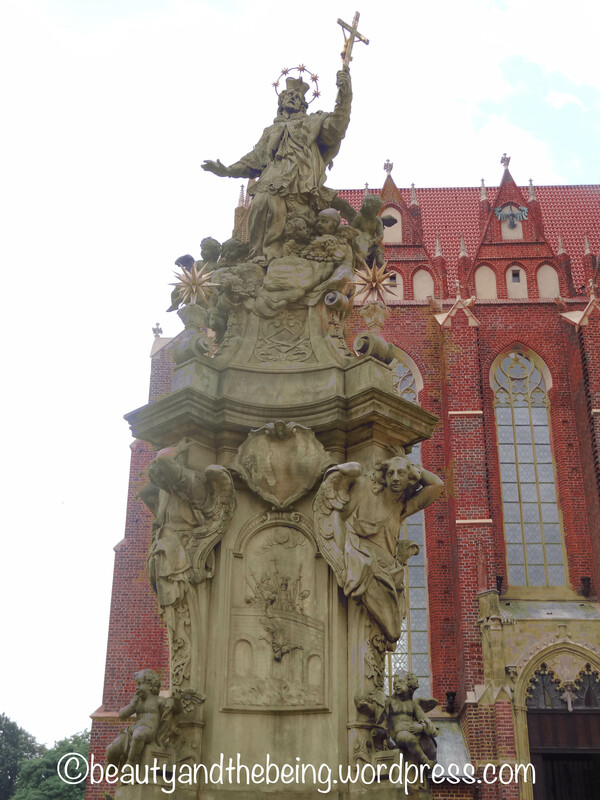 There is much more to Wroclaw but unfortunately I had to return back to Krakow the same day and had to cut short my exploration. I really hope to come back again someday to this lovely city and would love to stay here for a few days so that I could do justice to all the great things which this city has to offer.